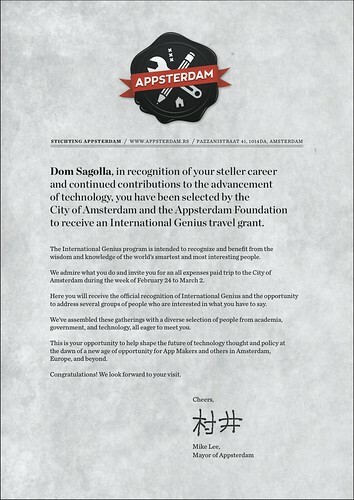 I’ve been selected to receive the first International Genius travel grant from the City of Amsterdam and the Appsterdam Foundation. I’m deeply humbled by this opportunity, and I plan to seek the utmost potential and set a pattern for other interesting people to follow. The Netherlands was recently named the Most Active Country on Twitter. This is a timely confirmation of something I’ve been saying for years: the Dutch lead by example. I want to meet with as many creative people in Amsterdam as possible during my stay. So, hit me up on Facebook and and Twitter. From February 24th until March 2nd, Holland I am yours.